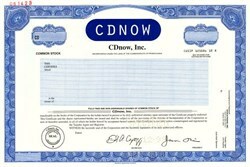 Beautiful engraved RARE specimen certificate from the CDnow, Inc printed in 1999. This historic document was printed by the American Banknote Company and has an ornate border around it with a vignette the company's logo. This item has the printed signatures of the Company’s President ( Jason Olim ). This is the first time we have had this specimen certificate for sale. 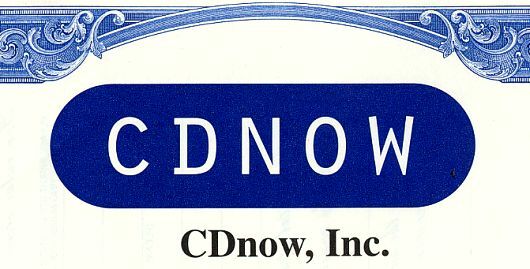 CDNOW was created in the August of 1994 by Jason and Matthew Olim. It was started in the basement of their parents home. Jason Olim became the president and CEO of CDNOW and his twin brother Matthew became the Principal Software Engineer. The company was incorporated in Pennsylvania in 1994 The company started by selling only CDs and has expanded considerably. The company eventually merged with Bertelsmann, the third largest media company in the world at the time.